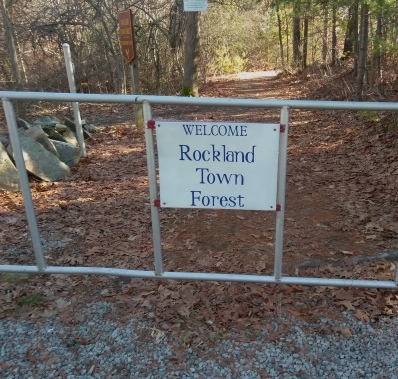 extends the hiking experience of the Rockland Town Forest. 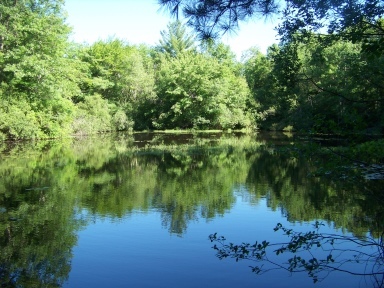 as it links to the Thompson Pond Trail in Abington. 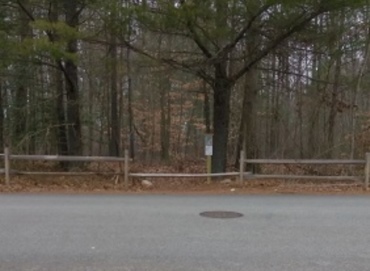 At the trail head of Twin Ponds Trail, the back entrance of the Rockland Town Forest is across the street. only about a third of a mile away. 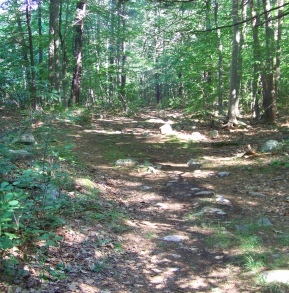 The two hiking trails located on Spruce St at the Rockland / Abington town line were developed by the Wildlands Trust. an attractive, rustic split rail fence. A large parking area is located here as well. Most of the trails already existed, but The Trust re-routed some which become flooded at certain times of the year. The result is a collection of very pleasant hiking trail routes. 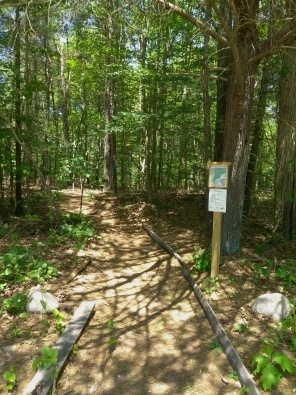 The Twin Ponds Trail is a series of loops, a large loop with connecting legs to two smaller loops. 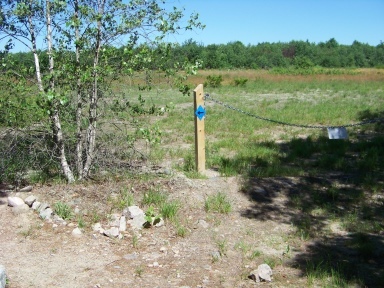 The hiking guide I offer here will take you on a route that uses all three with the possibility of continuing on to the Thompson Pond Trail. trail head to the hiking trails loop here. left out of the lot. Additionally there is space for one car across the street here, intended for a utility truck but usually never used for this purpose. 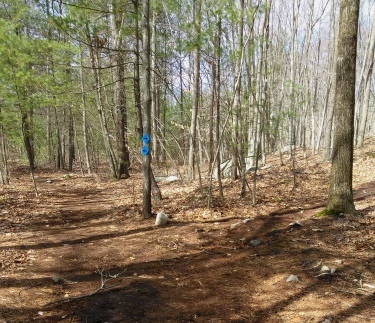 The map shows a future trail that will connect you from the parking lot to the trail head, but at the writing of this guide, it is still future work. The trail to be built will no doubt include a bridge over the stream that runs through here and connects to French Stream. 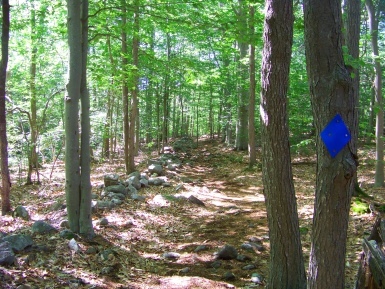 The hiking trail starts narrow and path like through the forest marked by blue diamond blazes. My first exploration was in late winter with snow on the ground. Immediately in, I found deer tracks in the snow. Only a few shorts steps later, the trail takes a right and runs parallel with Spruce St. 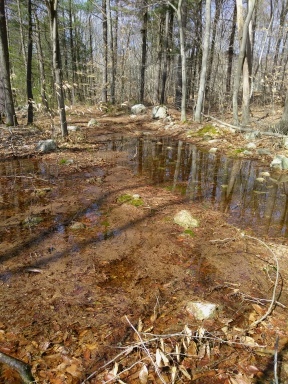 This section of the forest in early spring contains many vernal pools, so the emerging wildlife that start their life in these pools can be quite loud!! this trail to be extremely wet. done to remedy that problem. At .08 this cart path is redirected by a newer hiking trail running to the left of it. In the spring this older cart path becomes a small pond. In the summer it becomes overgrown and not as noticeable. 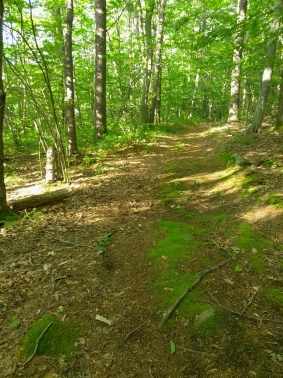 The newer trail runs gently uphill then turn right and reconnects with the cart path on the higher elevation. At .17 it comes to the first intersection. 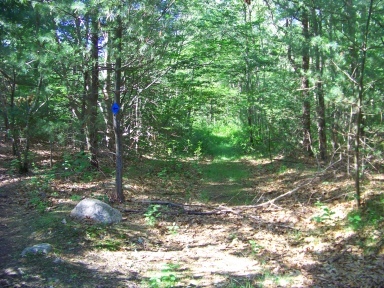 To the left is the larger first loop and the way to connect to the Thompson Pond Trail. The route to the Twin Ponds goes right here on a trail that is a bit wider yet. In the late winter a wind storm knocked a large section of pine tree down. This area being managed by Wildlands Trust, the intruding tree was promptly removed! Just shortly down this trail, views of one of the ponds open up to the left. Yet homes on either Spruce or possibly Salem St at this point are in view to the right. 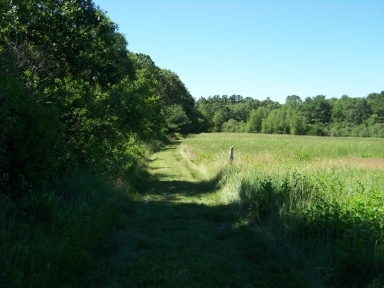 At .30 the hiking trail reaches the far end of the first pond and the trail takes a left. About 30 steps later at .34 it comes to a second intersect. Going to the left leads to a view point between the two ponds. Here you will find a bench. doesn't go far on the other side of this inlet. A beautiful resting spot for most wildlife. An enormous Blue Heron took flight from this pond as I visited! Continuing on the main trail to the right at this second intersect, in mid April the trail is considerably wet. At .39 a trail leads off to the right with red dots marking it. In summer it is not as easily seen. This seems to be a private trail as it leads into private property. Same area as above after the trail dries and reveals its rockiness. 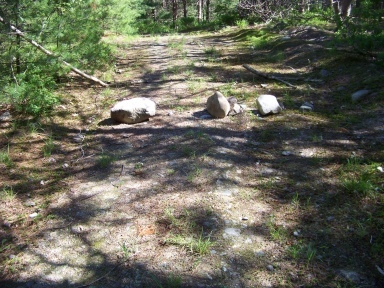 One of many trail redirects. The main hiking trail bends to the left and on the right is an interesting outcropping with a faint trail leading up it. To the left it can be seen that we are rounding the far end of the second pond. Soon at .44 there will be another redirect. 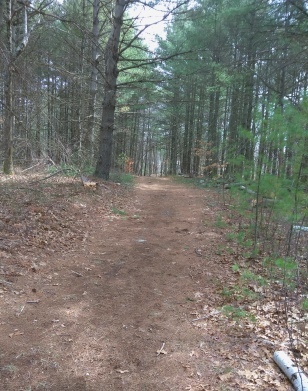 The older cart path leads straight and the newer trail portion will take a right on a narrow trail. If exploring the way straight, the cart path will become a small pond. Just a few steps up the newer trail will bring you to yet another intersection. Two more loop sections. Here, for this guide, going straight will bring you on the route through the whole property. 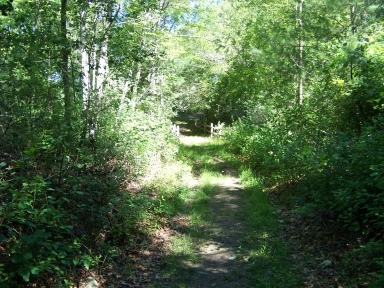 The trail leading left is the other end of this loop. 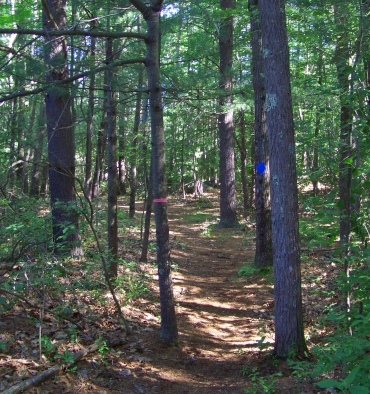 The trail becomes more narrow as it winds through the forest on a well defined trail marked by the blue diamonds. After the second marker it gently climbs. 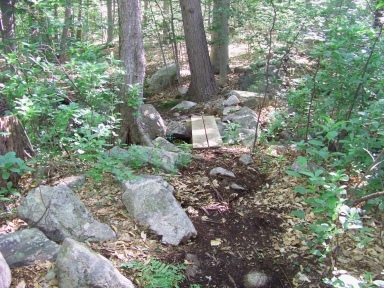 Here in mid spring there are many woodland pools making streams across the trail. At .46 another intersect. 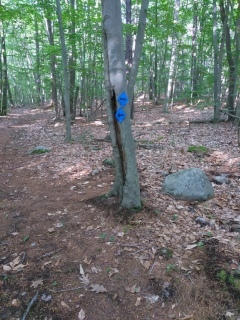 A couple of tree branches and an arrow pointing to the trail are all that are used to redirect hiking traffic. path after it became a small pond. It has a shallow blockage. Here the route takes a right and now continues on this latter portion of the original cart path. Along this stretch there are faint trails running to the left and one cart to the right which is flooded at the time of this hike. Other times it may be dry enough to use and shorten the hike if needed. 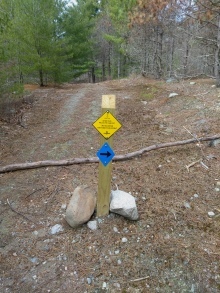 This sign was on the trail in the spring. At .58 the trail comes to a boundary limit. so the trail is redirected going to the right. During my summer hike, the sign is gone as well as the shallow blockage. No remains of the sign anywhere suggests it was purposely removed. The trail straight does continue for at least 1/2 mile, but the way of the loop trail turns right here. 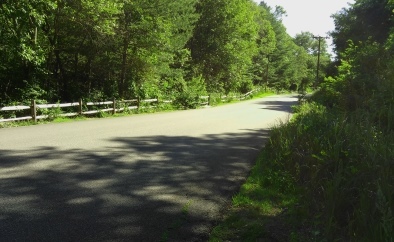 There is a short moderate incline on a narrow trail into a small cedar grove. This keeps leading to the right and soon goes downhill. 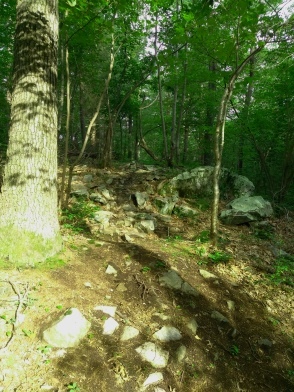 A rock wall soon appears to the left, and at the bottom of the hill runs close to the trail. Here the trail becomes rocky. Soon after, the trail will start a gentle incline and come to another intersect. Looking to the right, the flooded cart path that can be used as a short cut when not flooded. 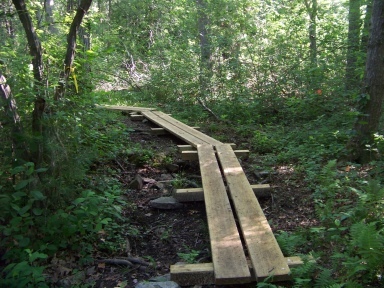 Straight, this loop trail will finish on a narrow path. To the left the cart path continues on to the third loop section. If you turn around at this intersect and look back on the trail, you will find another map of the area. Going left at this intersect, the hiking trail now leads downhill moderately. The trail looks to go straight, yet there is another small pond issue to deal with. As you draw near, you will find the trail goes to the right, through a rock wall and alongside of it, then over a small foot bridge. The trail then continues uphill and down again, through another wet area. At .84 the actual loop portion starts marked by arrows. Going straight the way is level, the way of our guide, if you go right here that portion is rocky and a bit uphill. The forest to the left is clear looking and appears to drop off. 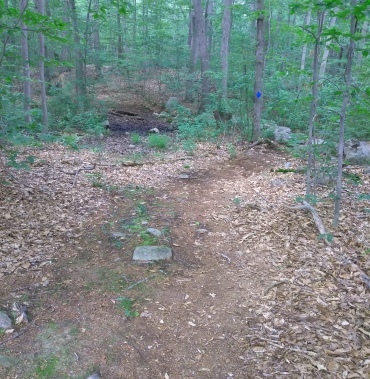 The trail turns to the left and there is a barely noticeable decline. The drop off seen through the forest presents itself as another body of water. The trail along this body of water becomes quite lush. Soon there will be rock walls forming to the left and a faint trail to the right that leads uphill. 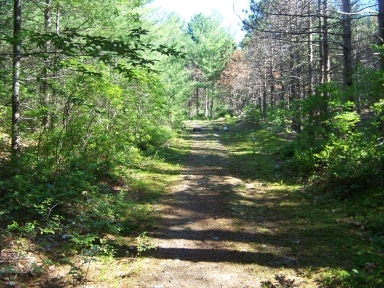 The hiking trail will start some gentle winding and shortly after come to another wildlife protection redirect where the trail will take a sharp right. 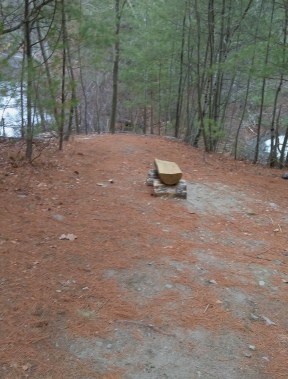 The trail now takes a moderate incline and soon some homes will come into view. Google maps claim this area to be behind Greenwood St in Rockland. The trail winds again, levels and turns a sharp right then soft left and through a rock wall. There will be another sharp right and a gentle decline, then the trail will become rocky. At 1.08 it will pass through another stone wall. The trail now becomes rocky and rough almost rustic. At 1.16 it evens out a bit, there will be a two step incline, then it winds a bit then runs on top of a rocky outcrop. There will be another two step incline and more rough terrain. and then meets the "lollipop" intersection of the loop start just after at 1.23. 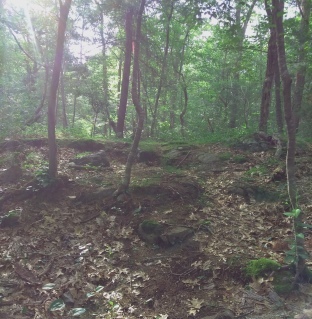 A look back at the rocky area of the third loop. At this intersection go left and follow this back to the intersection with the map at 1.35. Go left here to complete the second loop section. This portion will run up a slight incline and over rock ledge, then through a rock wall. It becomes winding again with an occasional rockiness. There will be a slightly blocked trail to the left. Don't know why this is blocked, it meets the original rock outcropping near the end of the second twin pond with a faint trail up it. Should be developed and used! 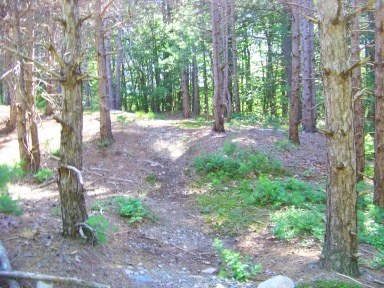 The main trail now leads downhill and comes out to the second loop intersection. Go left here along previously trod portion of trail. At the scenic area between the ponds our journey now clocks in at 1.46. At 1.60 we arrive at the first loop intersect, now go right here. This section is wide and road like. It bends to the left and declines moderately. 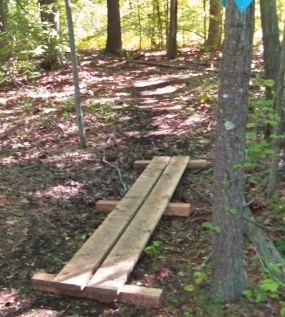 It passes through a wet area then a split rail fence lines both sides of the trail as it passes over an unnamed tributary of French Stream. Then it climbs uphill and leads out to an open field at 1.75. This may have been part of a runway at one time. There are several dirt roads here. 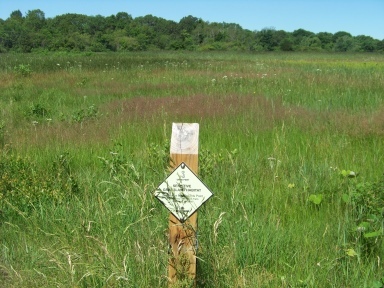 The Twin Ponds Trail takes a left and runs along the field. 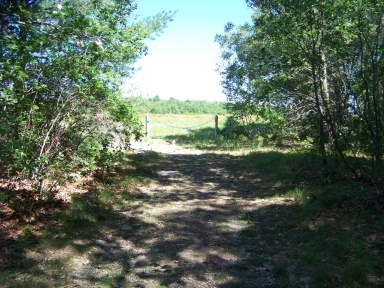 If you parked across from the trail head then walk along the side of the street to get to the beginning of the hiking trail. 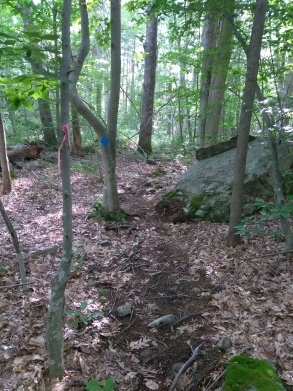 If you look closely at the map there appears to be a connecting trail, but the blocks showing that trail are spaced wider indicating where a future trail will connect the two trails. 1-2 across from the trail head. Moderate to extensive depending on route taken.